After recruiting their parents to join them for the Jingle All the Way 5k, Philadelphia, Pa., residents Wendy and Angela Hou (51:24) traveled back to their Herndon, Va., home a few days before the race. And just like many of this year’s participants, the two found themselves in a store Saturday evening shopping for items ahead of Sunday’s event. But the sisters weren’t there to pick up gels, water bottles, socks or additional pre-race items. Instead, they walked out of a Northern Virginia Michaels craft store with tinsel, ornaments and other Christmas accoutrements. [button-red url=”http://www.runwashington.com/wp-content/uploads/2015/12/120615_Jingle5K_RESULTS.txt” target=”_self” position=”left”] Results [/button-redThree members of Team Hou Hou Hous walked away with awards Sunday. Wendy Hou’s human Christmas tree earned first-place honors in the individual costume category, while her parents, Wen-Chun (51:24) and Shu-Ching (51:23), placed first in the couple’s category. Wen-Chun sported a red-and-white Santa Claus sweater and Santa hat, a paper beard and toted around three reindeer attached to wooden sticks. Shu-Ching donned a red-and-green elf hat and a matching red-and-green elf sweater. 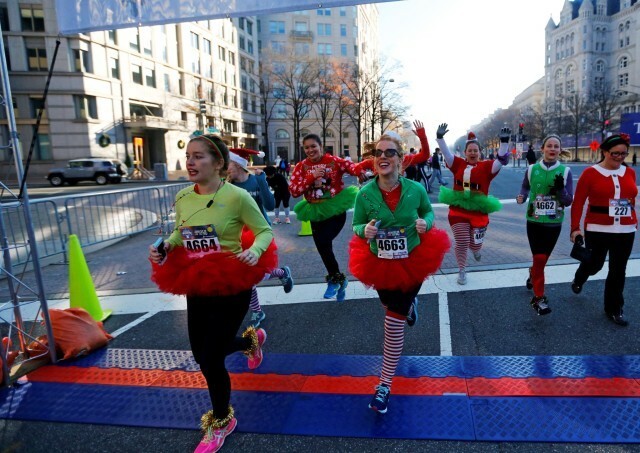 More than 4,500 runners flooded downtown Washington, D.C., early Sunday morning to compete in the popular holiday-themed race. Runners gathered at the start-finish line near Freedom Plaza on Pennsylvania, Ave., just before 9 a.m., and traversed the 3.1-mile course that took them past the U.S. Capitol building and on historic Independence Ave., before dropping them back off on Pennsylvania Ave. at to the finish line. Kevin McNab, no stranger to top finishes, bested all runners with a time of 15:31. But Ryan Witters proved to be a formidable opponent as he placed second overall at 15:41. Northern Virginia Running Club (NOVA) member Emily Potter, who will compete in the February 2016 Olympic Marathon Trials, cruised to a first-place women’s finish at 17:37. More than 20 of Potter’s teammates competed in the event. NOVA president, Erin Masterson (18:58), credited the group’s large showing to the race’s unique team categories. Potter wasn’t the only NOVA member to earn a first-place finish. Although the father-daughter duo of Marc (23:14) and Madelyn Stokes occasionally run together during NOVA practices and on some of Marc’s recovery runs, Marc said soccer is 10-year-old Madelyn’s sport of choice. After Sunday, running just might give soccer some competition. Madelyn Stokes placed first in her age group with a time of 23:11. Marc Stokes, 43, ran collegiately at Texas A&M University. He raced alongside his daughter on Sunday. While Sunday’s race marked the first for many runners, it was anything but for 71-year-old District of Columbia resident Barbara Johnson (35:49). Johnson’s first race, she recalled, was 40 years ago, and said she has enjoyed the sport ever since. Friends and fellow runners showered her with applause as she made her way to the award podium Sunday to collect her medal for finishing first in her age group. She said she runs nearly every day, and has participated in more marathons and distance running competitions than she can remember.